California State Motto | Eureka! I have found it! 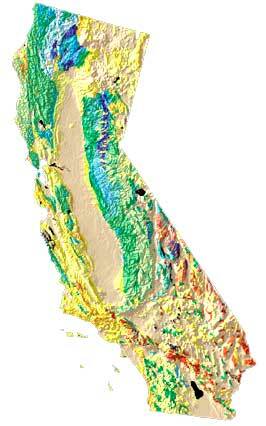 California geology and topography map (public domain image courtesy of USGS: A Tapestry of Time and Terrain). The motto appears on the California state seal and most likely refers to the discovery of gold in California (gold is also recognized as the official mineral symbol of California). "Eureka" is a Greek word meaning "I have found it" - the famed Greek mathematician Archimedes is said to have exclaimed "Eureka!" when he finally discovered a method for determining the purity of gold.